Professional photography for family, graduation, and business portraits. Our services include weddings, parties, and special events. Romance, joy, love, laughter...whatever your style, The Photography Studio photographers capture each moment of your wedding day with creative, artistic photos. Family history is precious. Children are born, graduate and marry. Parents age and pets pass on. Hold on to each moment with beautiful photo portraits by The Photography Studio. 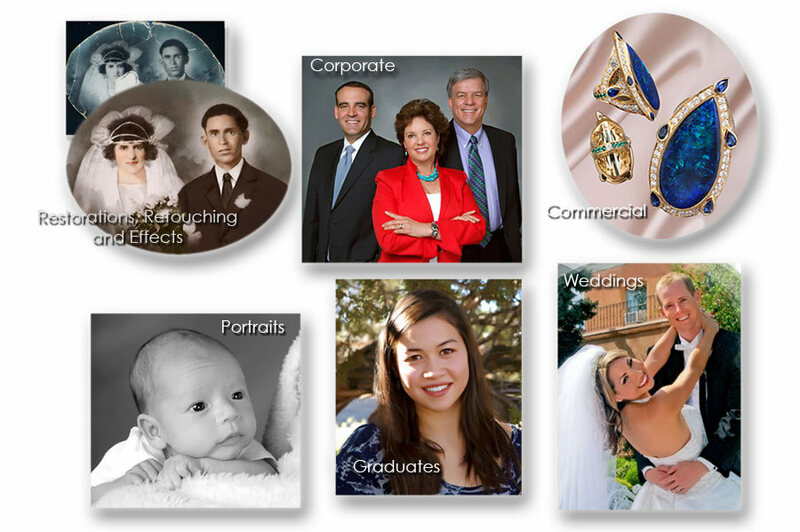 The Photography Studio in Santa Fe, NM is New Mexico's best choice for commercial photographs. Our product photography includes all types of artwork, such as paintings, flat work, fiber art. jewelry, pottery and ceramics, sculpture, bronze, glass, wood carvings, bead work and more. The Photography Studio in Santa fe, NM always shows you at your very best, with eye catching, natural portraiture of all types. Our photographers are experienced with family portraits, children, babies, and pets, including dogs, cats, birds, horses etc. The Photography Studio in Santa Fe, NM is New Mexico's best choice for graduation portraits. Our graduation photographers offer seniors lots of choices using our backgrounds, clothing, caps and gowns, drapes, tuxedos and other props. The Photography Studio The Photography Studio in Santa Fe, NM is New Mexico's best choice for professional copies and restorations of your old, faded and damaged pictures. We can restore almost any image, no matter how badly torn and stained it may be.